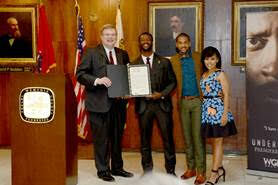 WGN America’s Underground Railroad escape thriller “Underground,”among the most critically acclaimed series of the year and the network’s highest-performing original series ever, was honored yesterday by the City of Memphis at City Hall as Mayor Jim Strickland officially declared Tuesday, May 10 “Underground Day,” kicking off day-long celebrations throughout the city, including a “Memphis Fan Appreciation” event with the stars of “Underground” – Aldis Hodge, Alano Miller and Amirah Vann – at the National Civil Rights Museum. Memphis is the highest-rated local market for the hit series throughout its run, delivering +302% above the average metered market in Live+3 ratings. Nationally, “Underground” draws 3 million Total Viewers on Wednesday night’s season-to-date in Live + 7 delivery. Hundreds of fans at the National Civil Rights Museum were treated to a sneak-peek of the highly anticipated “Underground” finale, airing tonight, at 10:00 p.m. ET/PT, followed by a Q&A with the stars moderated by Dr. Noelle Trent, the Museum’s Director of Interpretation, Collections and Education. The star-studded event was capped off by a meet-and-greet with enthusiastic fans. 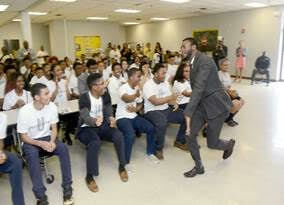 Earlier in the day, the cast visited a local Memphis school, surprising students with “Underground” gear. 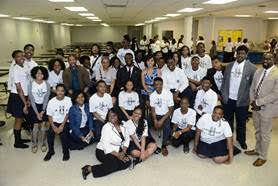 The festivities are a homecoming for “Underground,” which kicked off its season one awareness campaign in Memphis last October with an exclusive screening and panel event at the National Civil Rights Museum. The original series has since been lauded across the country at screenings, panels and appearances including a special presentation at The White House during Black History Month. WGN America’s standout series “Underground,” produced by Sony Pictures Television and Tribune Studios, was recently renewed for a second season. Production on season two will begin this summer for a 2017 premiere. From creators and executive producers Misha Green and Joe Pokaski, and executive producer and Academy Award®-winner John Legend, the 10-episode, hour-long program tells the unflinching story of a group of courageous men and women who band together for the fight of their lives – for their families, their future and their freedom. In the finale, entitled ‘The White Whale,’ airing Wednesday, May 11 at 10:00 p.m. ET/9:00 p.m. CT, the day of reckoning for all arrives, as new alliances are formed, old relationships transition to new dynamics and everyone is left to ponder what their own futures hold. 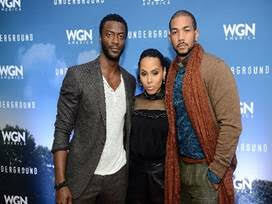 “Underground,” boasts a large and loyal fan base that live tweets the series each week, along with the cast and creative team, making “Underground” the #1 most social cable drama on Wednesday nights. The series trended worldwide on the same day the U.S. Department of the Treasury made its historic announcement that abolitionist and humanitarian Harriet Tubman, who led many enslaved people to freedom on the Underground Railroad, will appear on the face of the $20 bill, a decision lauded by the cast and creators. “Underground” features an acclaimed cast, including Jurnee Smollett-Bell (“True Blood,” “Friday Night Lights”), Aldis Hodge (“Straight Outta Compton”), Christopher Meloni (“Sin City: A Dame to Kill For”), Alano Miller (“Jane The Virgin”), ‎Jessica de Gouw (“Arrow,” “Dracula”), Marc Blucas (“Buffy the Vampire Slayer”), ‎Adina Porter (“The 100”), Mykelti Williamson (“Justified,” “24”), ‎Amirah Vann (“Girls,” “And So It Goes”), Johnny Ray Gill (“Rectify”), Chris Chalk (“Gotham”), Reed Diamond (“Agents of S.H.I.E.L.D.”), Theodus Crane (“The Walking Dead”), James Lafferty (“One Tree Hill”), Renwick Scott (“Treme”) and Jussie Smollett (“Empire”). “Underground” is created by Misha Green and Joe Pokaski who executive produce alongside Academy Award-winner Akiva Goldsman of Weed Road Pictures; and Joby Harold and Tory Tunnellof Safehouse Pictures. Visionary artist and producer John Legend, an Academy Award, Golden Globe® and multi-Grammy Award winner, and his Get Lifted partners Mike Jackson and Ty Stikloriusexecutive produce. Additionally, Get Lifted oversees all elements of the show’s music. Anthony Hemingway directs and serves as executive producer for the first four episodes.